Our minds are tricky. They are capable of great feats of creativity and insight. Some say that reality itself comes straight from our thinking minds—what we believe becomes what is. Our minds are tricky, they reveal great truths and tell us great lies. They help us find our way and are the cause of becoming lost. Gods of the mind are always tricksters. Tricksters are creators. They gift us with innovations and help us know ourselves. Tricksters can be tormentors, delighting in causing mischief and confusion. What is your relationship to mind? This lunar cycle seeded in the mutable air sign, Gemini, is a good opportunity to reflect on the ways of our minds. Gemini is the pollination season. Thoughts fly like dandelion seeds. This is the moment to release control over where the seeds will go. The dandelion seed is wild. It goes where the wind takes it. Under this influence, will we lighten our minds to meet in ourselves this image of rewilding? Can we be curious enough to wonder where our mind seeds will land next? Curiosity and release of control are good ingredients for the work of this lunar cycle. My mind has been troubled recently. I’ve noticed obsessive patterns of thought and heaviness about life in general. Have you? Astrological influences have included pressure from Pluto and Saturn in Capricorn. A trine between Neptune in Pisces and Jupiter in Scorpio has brought heart heaviness and deeper sensitivity. The square between Mars in Aquarius and Uranus in Taurus has added uncertainty and anxiety to the mix. These influences aren’t minor. Mind has created traps and doorways through this intensity. I am wondering how to navigate. Is it possible to practice a mind-full-ness that helps me re-center after periods of intensity and depression? This is the question that plants the seeds I will tend this lunar cycle. I seek to cultivate peace of mind this lunar cycle. This isn’t a peace that ignores or seeks to control where my mind goes. I want to be led by the dandelion and the spirit of Gemini to include wildness, wonder and curiosity in my search. This lunar cycle will see lots of change astrologically. 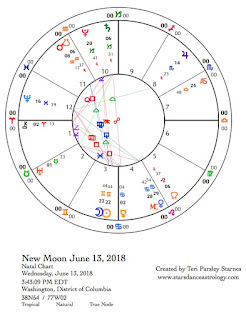 On June 13, the day of the New Moon, Venus enters Leo until July 9. Venus is as busy as a drag queen at Pride while in Leo this month. Venus supports passionate self-expression as they (I use gender neutral pronouns for the planets) make dynamic contact with Uranus in Taurus and Mars in Aquarius during this lunar cycle. This Venus influence creates sparkle and snap as we meet head on the changes that are in store while Uranus is in Taurus for the next seven years. They will be making a stretching quincunx to Saturn and Pluto in Capricorn. This Venus questions authority and confronts toxic power with panache. 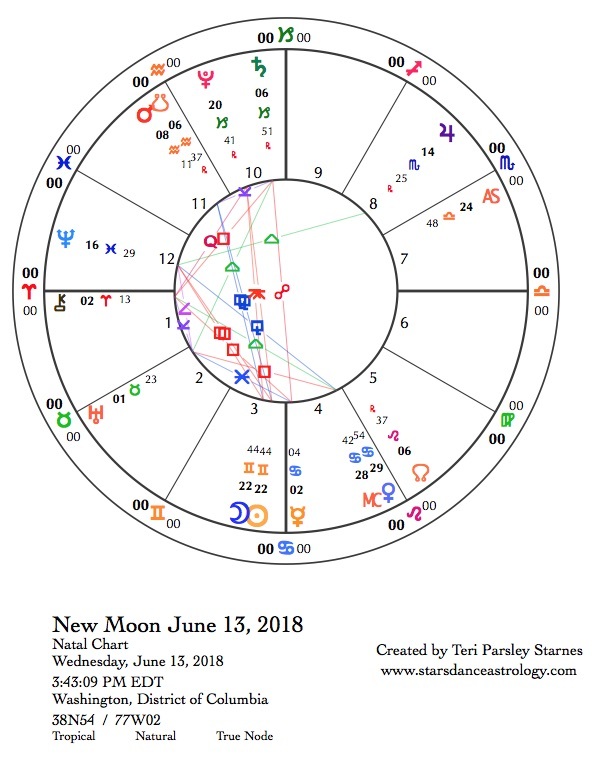 Right before the Full Moon, Venus will square Jupiter in Scorpio while making another stressful quincunx to Neptune in Pisces. Our emotions will resurface this lunar cycle and this Venus reminds us to combine fierceness and vulnerability to be truly transformative. Emotion impacts our minds this cycle. A trine between Neptune in Pisces and Jupiter in Scorpio, which perfected during the last lunar cycle, remains strong this lunation. These two planets have saturated us with memory and sensitivity. Collective feelings of sorrow and grief have swept over us. Both Neptune and Jupiter station and change directions this month. Their influence strengthens, especially when this trine becomes a grand water trine with the Sun in Cancer on July 5 and 6. Mars in Aquarius stations retrograde on June 26. Mars takes a retrograde journey every two years. During this hero’s journey, Mars will conjoin the south node of the Moon twice more, the first time was on June 8. Mars gathers karmic experiences related to Aquarius–memories of isolation, exclusion, and conformity may surface. More importantly, Mars will square Uranus in Taurus two more times. The first time was on May 16 after Uranus entered Taurus. The next two times will be August 1 and September 18. This aspect will begin to influence the fall elections in the U.S. Change is on the way but it may take a fight. Violence may be part of what is to come. This influence is even more of a reason to cultivate peace of mind this lunar cycle. We may tap into the water trines involving Jupiter and Neptune to recall that we are more than our ideologies. We are soul and we are hearts interconnected.